My daughter is at an exciting age where her math and language skills seem to be growing by leaps and bounds. She attends preschool now three days a week and is becoming more and more ready to attend school full time. Of course, making sure that she is adequately prepared is always at the top of my list, since school is so much more fun when it's not a struggle. Thankfully, Learning Resources has a super solution to developing those crucial early preschool skills that is both interactive and fun. Keep reading to see how the Pop Games Bundle might just send your little one to the head of their class! I reviewed the Preschool Pop Games Bundle from Learning Resources which retails for $37.99. My understanding of the Pop Games bundle from Learning Resources was a little sketchy at first because it took me 15 minutes to find the real instructions located under the removable label of the cylinder. Neither the website nor the outer label say anything as to where the instructions are located and I had a bunch of questions when first trying to play this game with my daughter. My first recommendation would be to print this information prominently on the outer packaging of the game or at least give a hint that the full instructions are located under the outer label. Once the instructions were found, the real fun began! Basically, there are two levels of play to the Pop Games bundle depending on the skill level of your child. In both levels of the game, you must spin the spinner to find out whether to take 1, 2 or 3 bubble cards from the jar. In the rhyming edition, you say the name of the object on the card and then say a word that rhymes with it. For instance, if you have a picture of a hat, then you should say something like cat or rat. In the colors edition, you draw out a bubble card and then say the name of the color and the object on each card. For instance, an apple is red. In the shapes edition, simply say the object and the name of the shape on the card and in the counting edition, the child should say the number represented on the card. Each edition contains 80 full color, double-sided cards so that there is plenty of variety available. If the child answers correctly, they get to keep the bubble card, but if they answer incorrectly, the card goes into a separate pile outside of the bubble jar. Of course, there's a twist to this game. There are several POP cards located inside the bubble jar. If one of these is drawn, ALL bubble cards earned must be placed back in the jar and the POP card removed from play. I love games which have a "go back to start" twist to them since no one is ever truly winning until the game is actually over. I've lost so many times to Riley in games like this and she squeals with delight when suddenly she comes from behind and wins. It also teaches her to be a graceful loser too when the POP card manages to snag defeat from the jaws of victory. In level one, whoever obtains 10 bubble cards first is the winner, whereas in level two, a winner is declared after all the bubble cards have been played from the jar. Whoever has the most correct bubble cards wins the game. 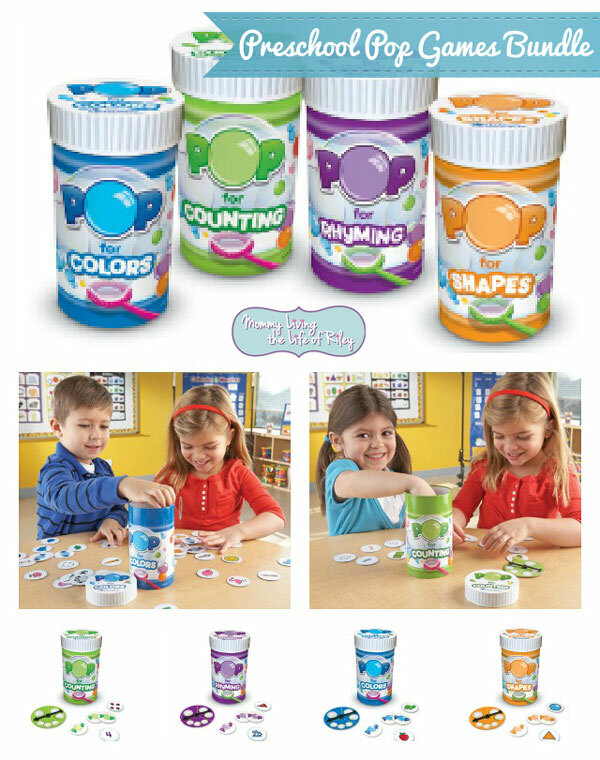 Although the Preschool Pop Games Bundle is recommended for children ages 3 to 6 years old, in my opinion, the Colors and Counting editions probably won't be relevant for children over the ages of 4. My daughter is 4 years old and is already tiring of these two games because they're too easy for her. She loves the Shapes and Rhyming editions however and I feel like these will continue to challenge her skills for years to come. Disclosure: I received the Preschool Pop Games Bundle from Learning Resources in order to facilitate my review. No other compensation was received. This product review is based on my own personal experiences with this item and is completely honest and objective. My grandson is learning to add so I would love to get him the Ten-Frame Treasures™. I like the Talk Links Recordable Sequencing Tiles – great for phonemic sequencing tasks! The New Sprouts™ Ring It Up Cash Register – My very own cash register is a great toddler toy. I like the farmer’s market vegetable basket. I like their New Sprouts Ring It Up Cash Register. I’d love to try the handy scoopers. They look like fun! Love the New Sprouts Ring It Up Cash Register for my little guy! I would want the Ten-Frame Measures. My toddler would love the cash register. The Primary Science Plant & Grow Set looks very nice!